Nevertheless, it doesn't stop people trying. 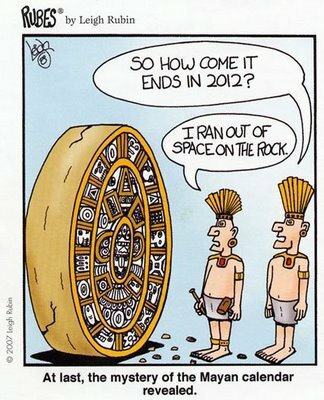 To be fair to the Mayans, it wasn't they who predicted the 21 December 2012 as the end of the world; they just stopped computing more dates. Over the years, there have been a multitude of cranks and oddbods attempting to predict the end of the world, so far with little success! Although I have very little time for the Jehovah's Witnesses, intriguingly their original prediction for the date of Armageddon was 1914 and it could be argued that their estimate was nearer than most. Certainly the states of Europe did their best to bring it about!